Thanks to WCLK I learned of the Schemes and Dreams Foundation benefit concert on May 5. 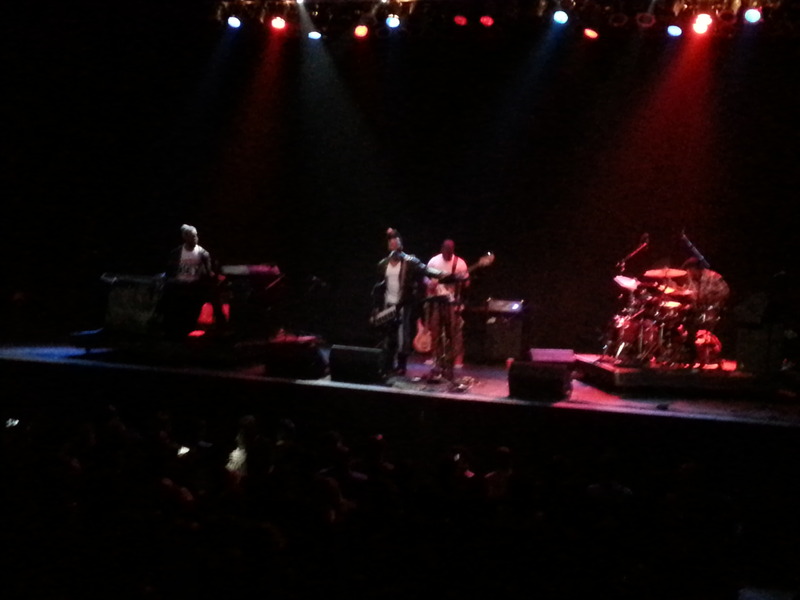 The featured performer for the evening was the Robert Glasper Experiment. At last I would finally get to see Glasper and the group in action after missing the opportunity to do so at Jazz Fest last year. Schemes and Dreams “is a 501(c)(3) based in Atlanta, Georgia that teaches our youth the value of nourishing their creative outlet while also creating a path to wellness and personal success. We provide programs for at-risk youth that avidly support them in formulating progressive schemes to follow and become their dreams.” The audience was able to enjoy the fruits of the foundation’s music program in the form of Jazz Future, a group of high school students. Jazz Future played a short set featuring a few standards and closed with a lively take on Roy Hargrove’s Strasbourg/St. Denis. Following Jazz Future were the Be-Hip All Stars. A collective of musicians who are all artists on Be-Hip Records. Standout performances from the collective came from Akeem Marable on saxophone and Lester Walker on trumpet. 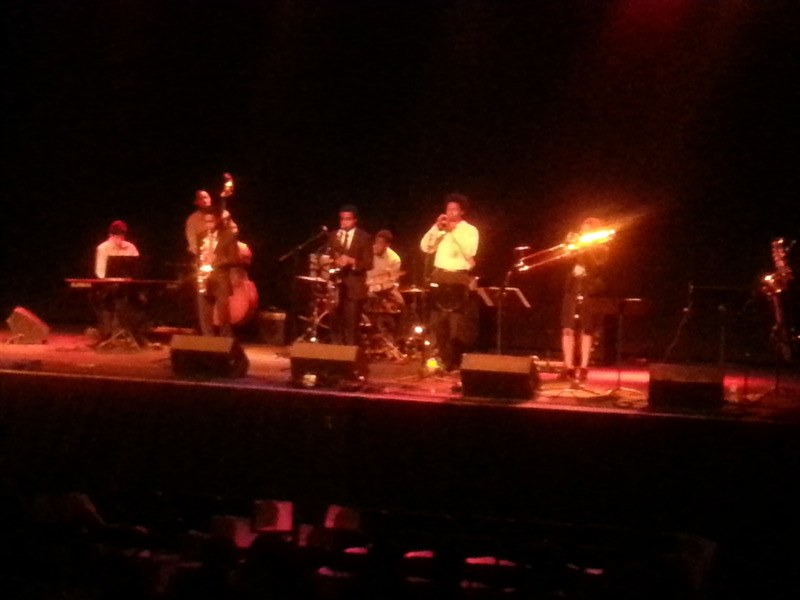 The collective closed with a nice rendition of Donald Byrd’s Alter Ego. The Robert Glasper Experiment entered the stage with Glasper thanking the audience for supporting Black Radio while making jokes about his belly, the Best R&B Album Grammy awarded to the group for the album, and how people think that he has all the artists that appeared on the album in his pocket. What we found out on this evening, was that it doesn’t matter who this group has in its company, it can play with anyone and play anything. This set list is an excellent representation of what the Robert Glasper Experiment is about, a cross genre musical exploration, with a jazz foundation. All the songs were at once recognizable, but were interpreted to be more funky, more mellow, more jazzy or more striking than the original. I loved every single minute of the performance but was particularly enthralled with their interpretations of No Church in the Wild, Cherish the Day and Smells Like Teen Spirit. Drummer Chris Dave is THE Funky Drummer that James Brown sang about it. Bassist Derrick Hodge has some bass virtuoso chops and is newly signed to Blue Note Records. Saxophone, Flautist, Vocalist Casey Benjamin can do everything. I’m not much of a vocoder person but Benjamin is GIFTED, he makes it sound sweet and there was all manner of swooning going on during Ah Yeah and Say Yes. Then there’s Glasper. 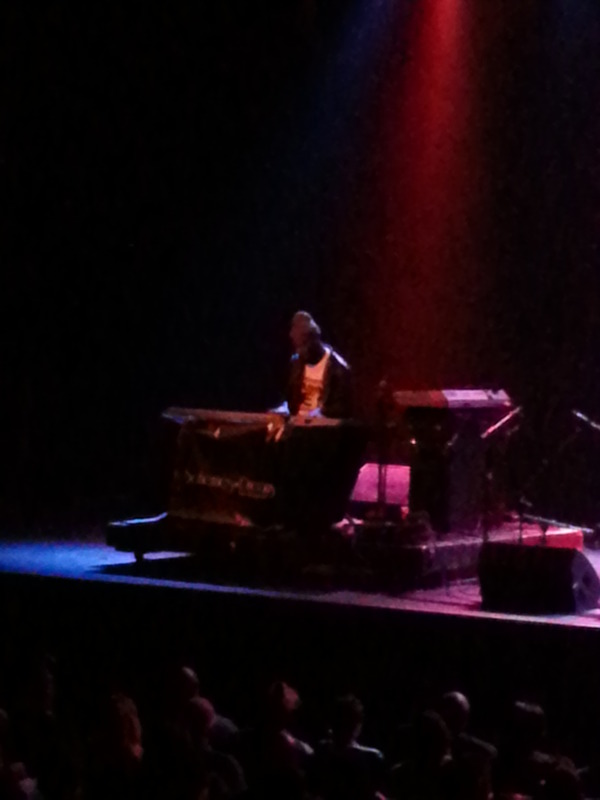 Glasper sat alone on stage under a red light. His playing, I’d like to describe as waves of sound. Not crashing waves, but continuous, consistent ones. These waves are produced on what sounds like five pianos/keyboards at a time. I did not recognize the songs that he played, what I did recognize was his technical prowess and his touch — waves. This Experiment is successful. The versatility, skill and musicianship of the band was on full display as evidenced by the set they played. The performance was seamless with some playful bits from Glasper interspersed. What I really enjoyed about this show was that the music was the star. As great as Glasper and his band mates are, the music they played moved the crowd and at the end of the day what else can you ask for. If the Robert Glasper Experiment comes to your town, queue up for a ticket if you want to hear and experience something that will stretch your musical sensabilities. For more information about the Robert Glasper Experiment and upcoming tour dates please visit the website. But thanks to Twitter I can get real-time results on them and flip to see performers I like. But, seriously I don't watch award shows. I went started boycotting them in 1989. I've watched two all the way through since then, the Source Awards the year Suge Knight dissed Puffy (yeah he was Puffy back then) and last years BET Awards in hopes of a Michael Jackson tribute, which was awful and to see Maxwell after his long hiatus (he was last). In fact I probably haven't been really excited about music award shows since MJ's Thriller days and Prince's Purple Rain days. What I found is that the people that I like never won and the shows were always too long and showed categories that I had absolutely NO interest in. As for 1989, two egregious things happened that turned me off FOR GOOD! I was watching the American Music Awards with my sister. The category was Favorite Male Vocalist Soul/R&B, the nominees were Michael Jackson, Bobby Brown and George Michael. George Michael won now granted this was his first solo joint it was hot but he was NOT R&B. My reaction and I'll never forget it, "a white boy who ain't even from here won best R&B male. My mind was made up I was THROUGH with music award shows. But this was a double whammy year. The biggest whammy of all came from the Grammy Awards. 1989 was the first year that Hip-Hop was category at the Grammys, the category was a mash-up called Best Rap Performance. The nominees were all over the place, JJ Fad, LL Cool J, Salt-N-Pepa, Kool Moe Dee and DJ Jazzy Jeff and the Fresh. Hip Hop had ARRIVED or so we thought, the revolution would NOT be televised. The award was not televised and Public Enemy, Jazzy Jeff and the Fresh Prince and more boycotted the Grammy's. I joined them. The music was too important, it was moving a nation of young folk, urban folk, black folk and white folk. I was appalled and I still am. Seems not much has changed since then. It's 2010 and as I watched the tweets roll by I didn't see ANYTHING about the hip-hop categories being televised. I then lucked up and saw one, best Rap/Sung collaboration (who comes up with these things?) Jay-Z won it and he was there to accept it, but Kanye wasn't. The story as far as I'm concerned remains the same. The folks you want to win usually don't, people who have zero skills usually do and the categories that the fan really cares about are not televised. That's the surface stuff. The beneath the surface stuff is that OUR music, music created by US, originated by US STILL after all these years and now gazillions of units sold and gazillions of $$ into the majors pockets and we still can't get air time. That's why I don't watch. I can take your word for what happened or read about it on the web later. get to hear his musicality on this set. Here’s my track by track opinion. becomes more groove as it goes on. sound but the remaining instrumentation has more of a fusion sound. million times.” The song is really about the guitar, the keyboards, the groove. repeats of the chorus. The feature on this cut is the piano. heels on girl, put them heels on lady.” Love the energy of this one. herself and her daughter. Really nice groove on this one. CD and could have easily fit on the last ATCQ CD. Renaissance which had a much bigger sound. relief, one that will stay in the rotation. Good music is good music, that’s what Q-tip is delivering on this one.